When looking for the right window company, every homeowner will be looking for different things based on the condition of their old windows and their budget. But regardless of what you are looking for you will want a window company that provides a quality product, performs good installation, and offers a warranty that reflects the quality of the product and workmanship. Before you begin narrowing down the list of window companies you should get a quote from, it’s good to have an understanding of which windows can be considered efficient for the Bellville and area climate. Make sure new windows are suitable for your climate is by purchasing windows that have been CSA certified. Energy Star and CSA rely on similar performance requirements to certify and rate the windows. The benefit for you as a customer is that all this information is publicly available, so you can see exact performance numbers for different companies. Check out all the Energy Star rated companies on this Natural Resources Canada website. Vinyl bay windows are a great way to add extra space and light to a room and create a unique design piece for your home. Bay windows are composed of three windows that extend from the exterior of your home. This area is often used to provide addition seating and enjoyable views, and is sometimes referred to as a sit-down bay. 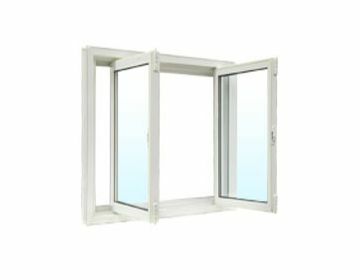 Typically, they consist of one large fixed (stationary) window in the middle and a casement window on either side. Vinyl bow windows are a series of four or more adjoining window units, with five being the most common. All units can be stationary, operating or any combination. Vinyl bow windows provide sweeping views and create another dimension to your home. They can also provide an elegant window seating area to enjoy the view. 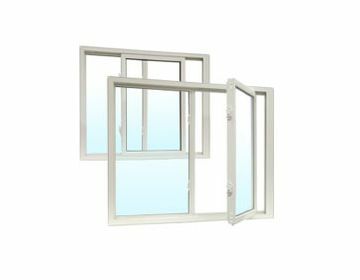 High profile frames are better suited for casement and awning windows. 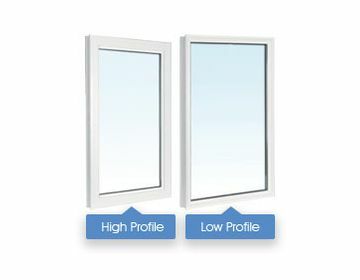 Low profile frames are well suited for slider and hung windows. High profile windows are labelled with a letter “F”, while low profile windows are labelled with a letter “P”. 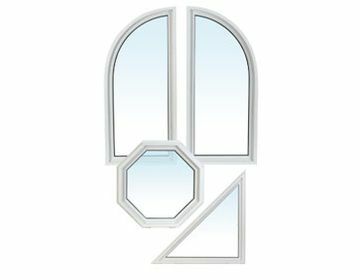 Custom-shaped vinyl windows are specialty windows consisting of shapes or angles other than 90 degrees. They are available in a variety of shape configurations to create unique, artistic designs. A single hung vinyl window operates vertically (up and down). One sash is stationary and the other sash moves up and down, and can tilt into the room for easy cleaning. 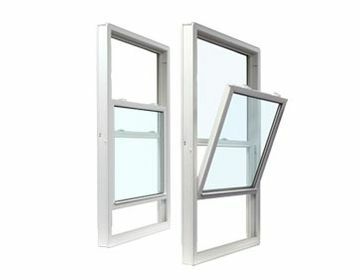 Double hung vinyl windows have two sashes that move up and down, and both can tilt into the room for easy cleaning. You have the benefit of opening one or both sashes at once, controlling the ventilation in your home. 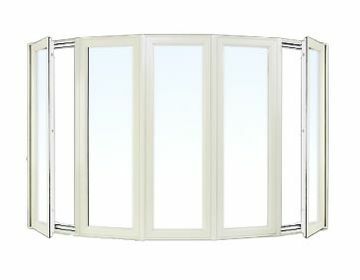 A single tilt sliding vinyl window operates horizontally (side to side). One sash is stationary and the other sash moves up and down, and can tilt into the room for easy cleaning. 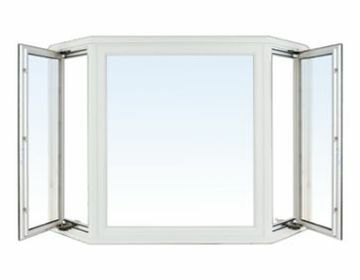 A double tilt slider vinyl window has two sashes that move sideways. One or both can tilt into the room for easy cleaning. You have the benefit of opening one or both sashes at once, controlling the ventilation in your home. The end vent slider features two venting sashes with a low fixed center sash. 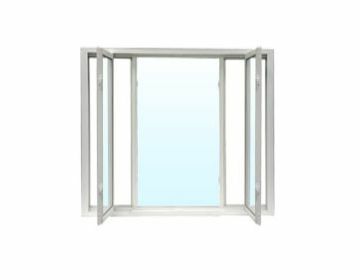 When a window opening is wider than 74 inches and a sliding option is desired, the end vent slider is the most effective option available. 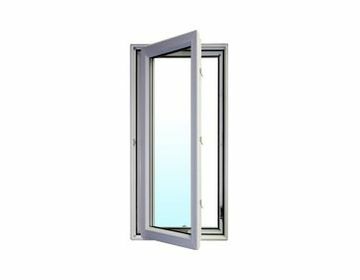 Casement windows open outward by cranking a handle and provide a great unobstructed view to the outside as well as superior ventilation. Replacement vinyl casement windows can open to the left or right depending on your preference. Casement fixed windows are a combination of casement and fixed windows. 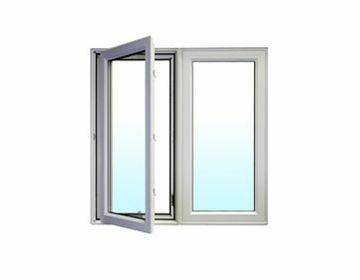 Casement windows can open to the left or right depending on your preference, while the fixed side is stationary. 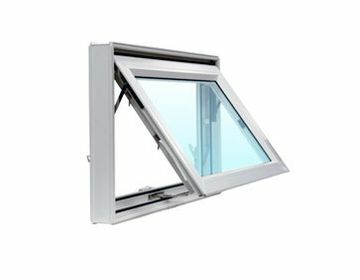 Awning windows open outward from the bottom up. They are operated by cranking a handle that pushes the bottom of the sash out, allowing excellent ventilation while keeping rain water away. We want to answer all the questions you have about replacement windows and provide you with an exact price, without any hidden fees. We find it necessary to see the structure of your home, the style of your windows, and types of interior and exterior finishes in order to come up with an accurate quote. Please Contact Moira Glass today to arrange a consultation. Replacement windows may not be at the top of your list of home improvement projects, but perhaps they should be. When you notice that your windows are foggy, drafty, difficult to open and close, or have rotten frames or sills, it's time to examine the tremendous benefits of replacement windows. New windows save energy, provide consistent temperatures in your home, improve your home’s curb appeal and increase security. In addition, if you ever choose to sell your home, replacement windows can yield up to a 73 percent return on the investment. Purchasing new windows might seem costly at first glance, but after evaluating your monthly energy savings year after year, it’s one of the best home improvements you can make. Older, single-pane windows are often the source of up to 30 percent of your home's heat loss. In contrast, energy-efficient replacement windows are designed specifically to keep heat in or out, depending on the season. New windows keep extreme weather outside. Energy-efficient windows can reduce the demand on your heating and cooling systems by up to 25 percent allowing you to make your home more comfortable at a lower cost. Premium window insulation. 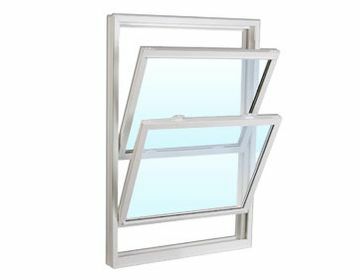 Double- or triple-pane replacement windows are now filled with gas, typically argon or krypton, to help keep air from escaping your home. “Low-e” (low thermal emissivity) windows have a very thin coating applied to the glass. This coating reflects various solar waves, such as long-wave infrared energy (or heat) from the sun, keeping your home more comfortable. Combined with double- or triple-pane glass and argon or krypton gas, low-e coatings can significantly improve the thermal efficiency of your windows. Not only will you see immediate savings in your monthly costs, but you might be able to receive instant savings offered through rebates for new windows from your utility company. You may also be able to claim a deduction on your income taxes for your energy-efficient replacement windows. If you replace your windows tomorrow and sell your home the following day, you will be able to recoup the majority of your cost. That alone makes it a worthy investment. Better yet, stay in your home and choose new windows you can enjoy for many years to come, knowing they are an excellent investment as well as a beautiful addition to your home. There are other monetary benefits of new windows. Your property value may increase, which also increases your resale value. An often overlooked benefit of replacement windows is curb appeal. The ever-increasing selection of window types, sizes, colors, hardware finishes and styles allows you to match your windows to your home's design or update its look. The continuity of your home's appearance can greatly influence the appraisal of your home. Curb appeal can make or break the sale of a home. Additionally, replacement windows with multiple locks can also lower your insurance costs. This added value also increases appeal to a potential homebuyer. Emotional security certainly adds to the appeal and perceived worth of your home. Your home is your castle. It's the place you live, learn and grow. It's the place you go for comfort. The benefits of replacement windows are far greater than the cost. They improve your home’s overall environment with benefits like natural light, noise reduction, improved views and custom style. New windows can offer UV protection for walls, fabrics, flooring and furniture, which lengthens the life and quality of your home's interior. They also require very little maintenance, allowing you more time for activities you enjoy. Consider the benefits of new windows for your home and how they can improve your quality of life.